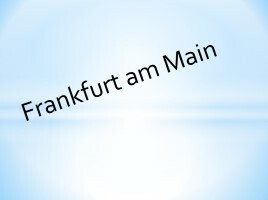 In the canton (left upper corner) there is the Union Flag. Under the Union Flag there is a large seven-pointed star known as the Commonwealth Star. To the right of them there are five white stars (one small and four big ones) – they are the Southern Cross constellation. The coat of arms is framed by the golden wattle (acacia). 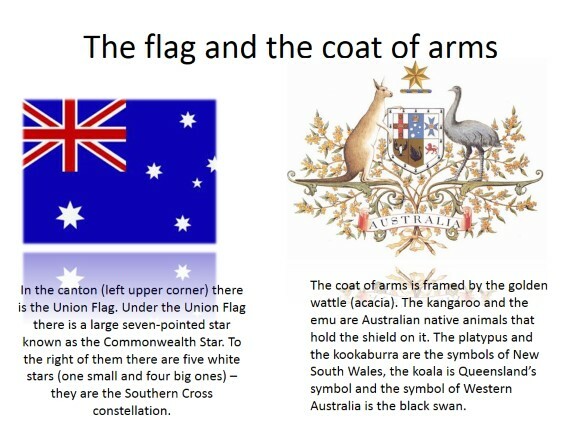 The kangaroo and the emu are Australian native animals that hold the shield on it. 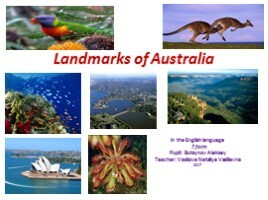 The platypus and the kookaburra are the symbols of New South Wales, the koala is Queensland’s symbol and the symbol of Western Australia is the black swan. 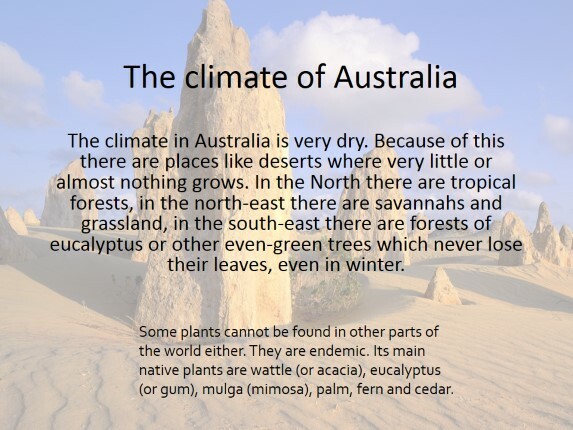 The climate in Australia is very dry. 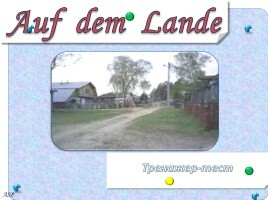 Because of this there are places like deserts where very little or almost nothing grows. 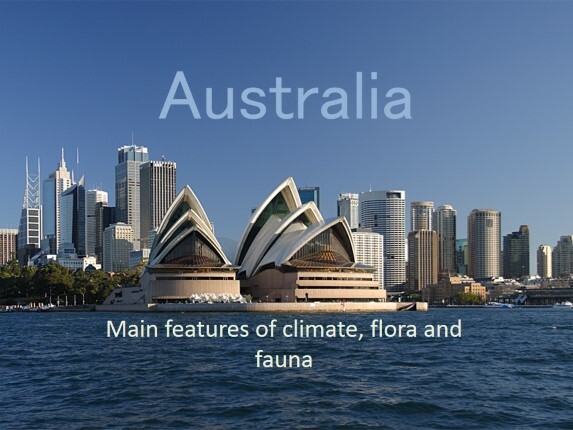 In the North there are tropical forests, in the north-east there are savannahs and grassland, in the south-east there are forests of eucalyptus or other even-green trees which never lose their leaves, even in winter. 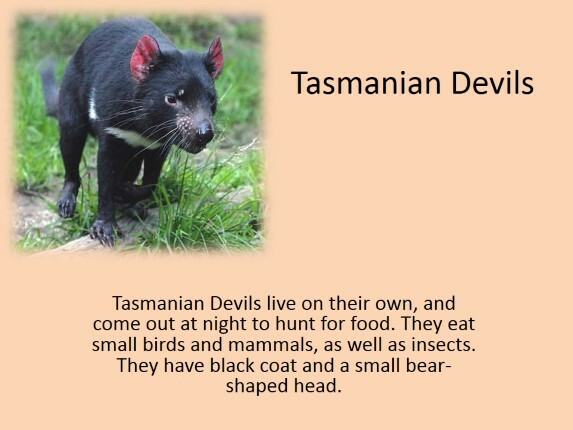 Some of Australia’s fauna can be very dangerous to people. There are crocodiles in the North. 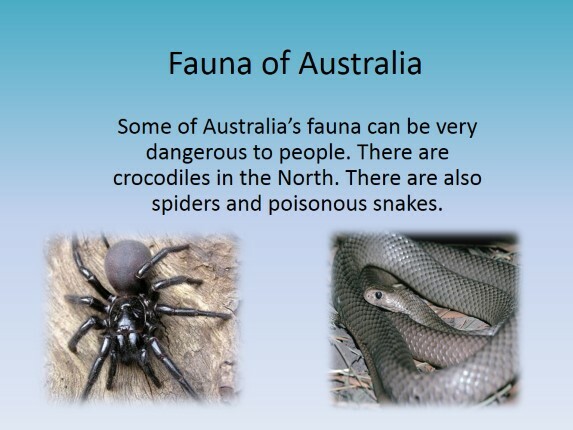 There are also spiders and poisonous snakes. 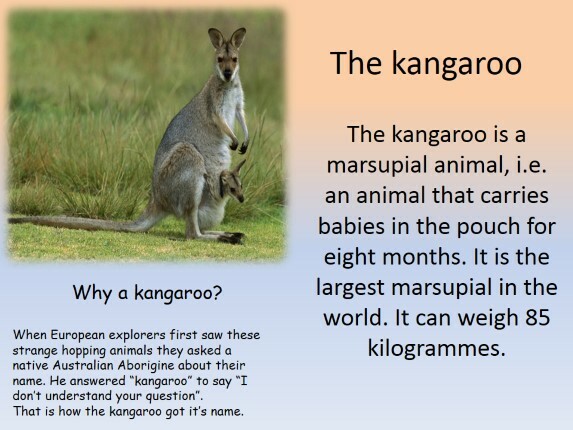 Why a kangaroo? When European explorers first saw these strange hopping animals they asked a native Australian Aborigine about their name. He answered “kangaroo” to say “I don’t understand your question”. 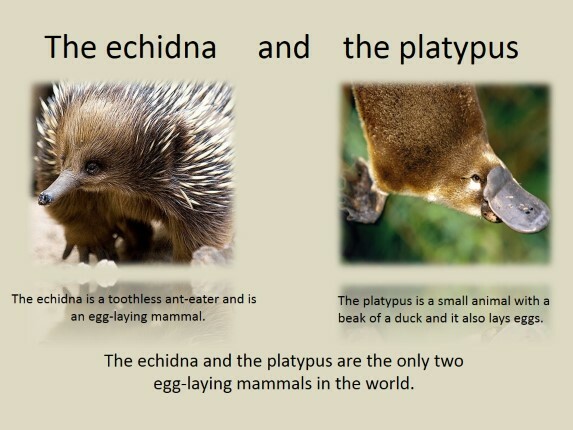 That is how the kangaroo got it’s name. 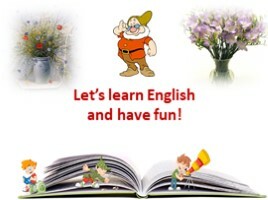 The koala is a small bear-like animal which lives in the eucalyptus trees. 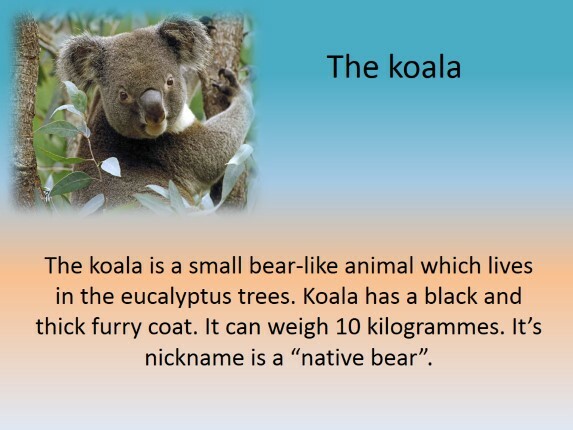 Koala has a black and thick furry coat. 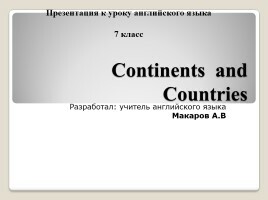 It can weigh 10 kilogrammes. It’s nickname is a “native bear”. Uluru , also known as Ayers Rock, is a massive oval orange-brown rock formed about 680 million years ago in Australia. Uluru’s length is 3.6 km, width is about 3 km, height is 348 meters. 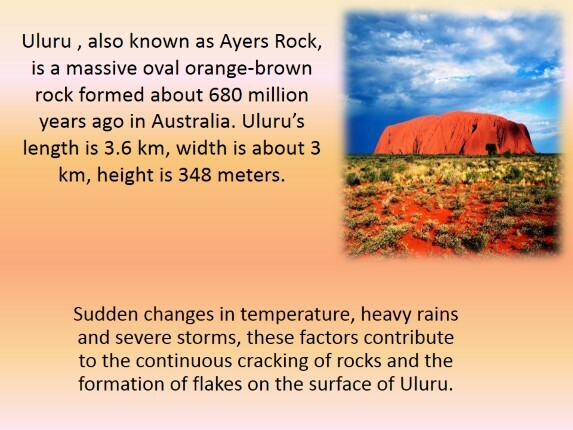 Sudden changes in temperature, heavy rains and severe storms, these factors contribute to the continuous cracking of rocks and the formation of flakes on the surface of Uluru. Uluru is a large sandstone rock formation which is located in the southern part of the Northern Territory, in the central Australia. 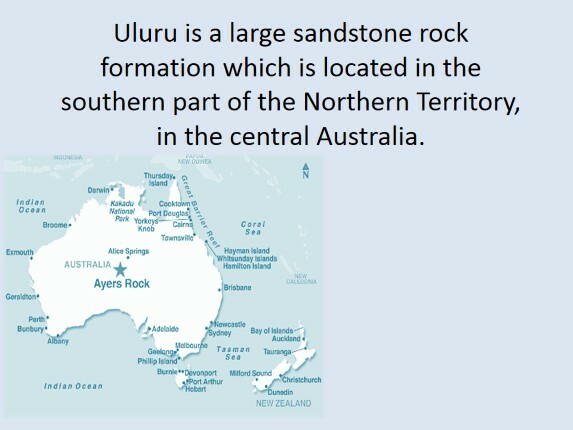 Uluru is associated with many legends. Eyewitnesses claim that something mystical in the rock still exists. In this area occasionally something amazing happens – wind suddenly starts blowing in the incredible heat, the sky is covered with clouds, and it begins raining just above the sacred mountain. 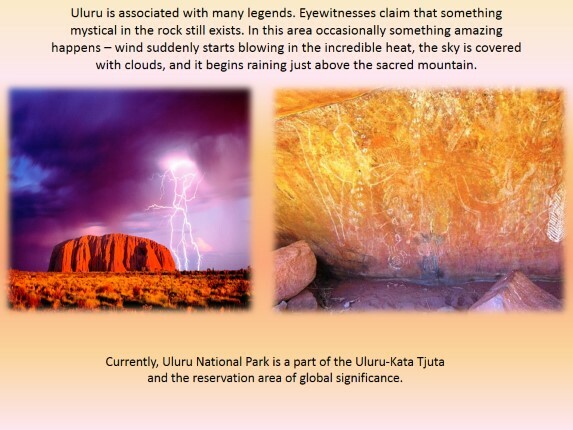 Currently, Uluru National Park is a part of the Uluru-Kata Tjuta and the reservation area of global significance.